When using the Foam Blaster, always spray detergent on the surface to be cleaned when it is completely dry. A wet cleaning surface will dilute the detergent and reduce its effectiveness. 1. Unscrew detergent bottle from the Foam Blaster. 2. Fill the detergent bottle with the desired amount of pressure washer detergent. 3. Fill the detergent bottle with water (for best results, use warm water). 4. Attach the detergent bottle to the Foam Blaster. 5. 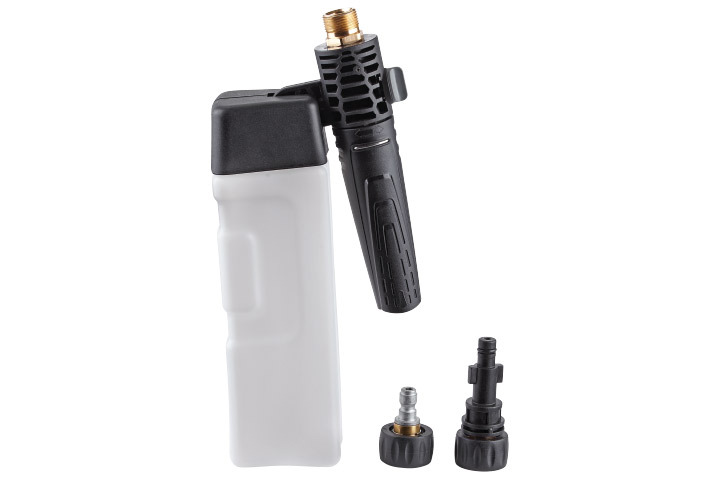 Attach the Foam Blaster to your pressure washer and start spraying foam! Using a pressure washer to clean your car reduces water consumption by up to 80% versus a standard garden hose without an automatic shutoff nozzle. Add in the Simoniz Foam Blaster and you have the perfect eco-friendly at-home car wash that conserves water and minimizes unnecessary grey water runoff. Scratches and swirl marks are often the result of incorrect washing equipment and techniques, which tend to compress fine dirt and grime into your car’s paintwork resulting in a scratched, dull and neglected finish. Pre-soaking your vehicle with the Simoniz Foam Blaster loosens dirt and reduces the likelihood of scratching from excessive rubbing and scrubbing. 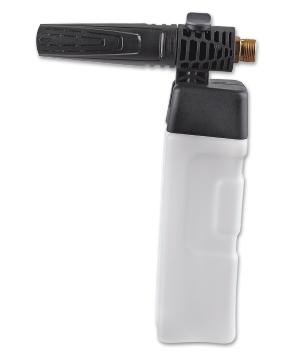 The Simoniz Foam Blaster uses a hi-tech air injection nozzle system to generate a large volume of dirt busting snow foam. A typical automobile can be presoaked with foam in under five minutes. For the perfect foam wash, the Simoniz Foam Blaster should be used with the Simoniz All-Purpose Pressure Washer Detergent (39-4536-2) or Simoniz Car & Boat Pressure Washer Detergent (39-4537-0).